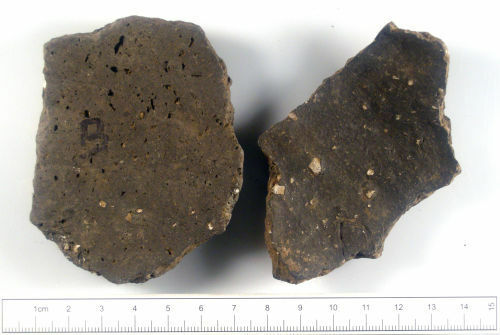 Two large wheelmade body sherds from simple cooking pots, from the 4th Century. The exterior of the bowl (on one sherd) has been decorated with parallel rows of incised lines. There is also a series of large incised U's on the pot. 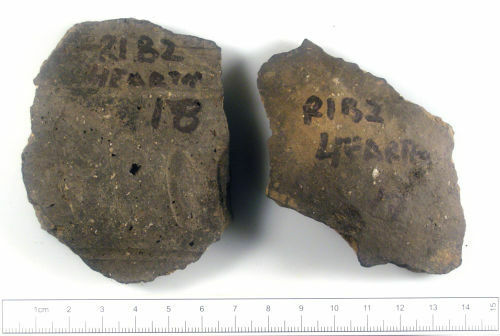 The sherds are both from Calcite gritted ware, produced in the UK. It is unusual for these pots to be decorated. Holes in the pots surface shows where some of the calcite tempering has leached out of the pot since it was buried.